FORT MEADE, Md. (June 05, 2015) -- The debut of the new noncommissioned officer, or NCO, evaluation report, or NCOER, expected as a cure for rating inflation, has been pushed to the new year. During an Army birthday town hall meeting with Soldiers, June 4, Sgt. Maj. of the Army, or SMA, Daniel A. Dailey said the new NCOER, which was originally slated for release in October, would instead be pushed to 2016. The additional time will allow for a fine-tuning of the process and procedures for tracking rater profiles to ensure Soldiers have a fair chance at promotions while also preventing rating inflation. Sgt. 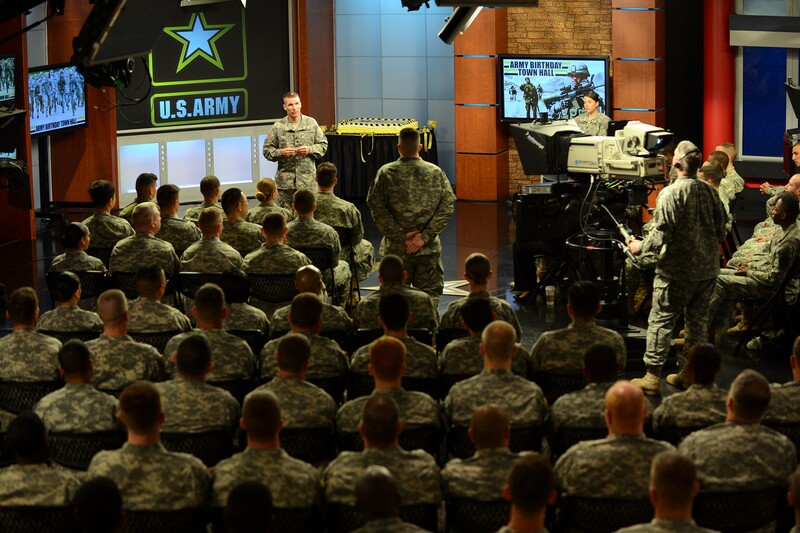 Maj. of the Army Daniel A. Dailey discusses Soldier evaluation, education and compensation during an Army birthday town hall meeting with Soldiers at Defense Media Activity on Fort Meade, Md., June 4, 2015. During the town hall meeting at Defense Media Activity here, Dailey answered questions from more than 100 Soldiers in the audience. He also answered questions, which came into the studio via social media, and via pre-recorded video message from Soldiers throughout the world. In terms of training military human resources specialists on how the new NCOER will work - that training has already been completed, Dailey said. Those human resources Soldiers will in turn train their units on how to use the new NCOER web system and forms. One of the biggest changes to the new NCOER, Dailey said, is that it introduces rater accountability as a way to address the issue of rating inflation. The NCOER was both "out of date" with Army doctrine and subject to rating inflation, Dailey said. "We have to get at that. We have to make sure, that our people we ask to run promotion boards, have the full capability to understand and know who is best for promotion. This new NCOER is going to help do that." Dailey said that for years, those who have rated Army officers have been held accountable for how many they rate as being "the best." The new NCOER introduces a similar concept for enlisted Soldiers. Under the current NCOER, he said, "everybody in the Army had the potential to get a number 1 block. In most cases, that's what happened." When every Soldier is rated as the best, he said, it makes it difficult to decide who gets promoted. "With a rater profile, your rater is going to be limited on the total number '1 blocks' they can give out," he said. The new standard for Soldiers, he said, will be "fully qualified." Only those exceeding the standard will be marked higher. He told Soldiers that those of them who rate "fully qualified" will still be getting promoted. "We are designing the system so that you can get promoted; you will get promoted if the rest of your records are consistent with the good order and discipline of the U.S. Army," he assured them. Addressing a related question regarding promotions, the Dailey told Soldiers that one thing they should be doing each month - something many Soldiers fail to do, and pay a price for by not getting promoted - is ensure that their personnel records are maintained and accurate. "Later on in your career, when you get evaluated by a board, that's what your representation is - your file," he said. Dailey also said that there are some daily activities Soldiers can do to get a leg up on promotion: physical training and education. "Challenge yourself every day," he said. "It starts at 6 a.m. You can make a difference as early as tomorrow morning. You can add points to your promotion standing just by doing better at PT. Once more pushup is one more point. One more sit-up is one more point. And study hard, do your structured self-development." The sergeant major acknowledged that as the Army draws down, there will be fewer actual promotions, because there will be fewer Soldiers. But he said the Army still needs to promote Soldiers to have the right leaders in the right positions. He said Soldiers will still get promoted in the same percentage in order to ensure the Army structure is maintained. "As Soldiers transition and the need arises, the Army will continue to promote in accordance with these needs," he said "We will continue to, and have to continue to promote our Soldiers. Be persistent, do your best." From basic training, to learning their military occupation specialties in advanced initial training, attending leadership development courses, professional military education, and structured self-development, Soldiers spend a lot of time in the Army learning and developing their skills and leadership potential. Dailey said the Army wants to make sure that what those Soldiers learn is not wasted when they move on to the civilian world after an Army career. 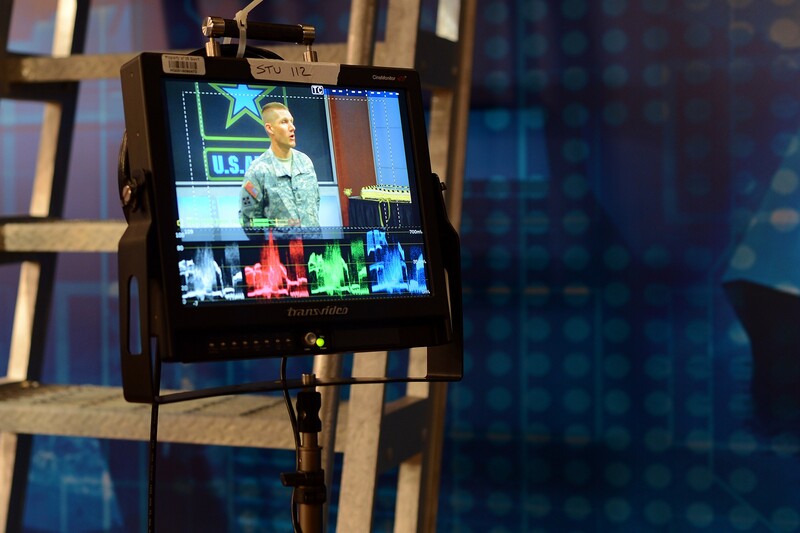 The ongoing "NCO 2020" study, in its second year, has identified that the Army must get better at certifying and credentialing Soldiers for the things they learn while serving, Dailey said. What knowledge and skills Soldiers learn in uniform must be easier to translate into jobs in the private sector - as all Soldiers eventually leave the Army. Already, Dailey said, the Army has found a way to ensure Soldiers get civilian-equivalent credit for their NCOES education. "The common core curriculum - not your specific MOS [military occupation specialty] - from the time you start your first NCOES course, to the time you graduate your last one, is worth 100 college credits," Dailey said. "That's the largest it's ever been throughout our history. But that's not enough. We are going to continue to do that, to make sure we give you the valuable credit that you have earned." The Army is still making changes to the NCOES to make it more challenging, valuable and relevant to Soldiers, Dailey said. The Army is planning on adding another level of NCOES for master sergeants, for instance, called the master leader course. Curriculum at the Sergeants Major Academy has also been re-rated, and the Army is in the process of accrediting that education at the masters level. For younger Soldiers and NCOs, he said, the Army is working with civilian counterparts to get them maximum credit for their NCOES education. Dailey said 18 months ago drastic changes were made to what is called the warrior leader course, or WLC. An additional change to that course will be a new name - the basic leader course. He said the name change is meant to help those in the private sector who might see it on a résumé better understand what it means. The SMA said that for now, beyond the name change, there are no additional changes expected for the WLC. Next year, the Army plans to bring Army University online -- part of the Combined Arms Center on Fort Leavenworth, Kansas. The Army University represents a multiyear plan to better align Army education programs. The university organizes professional military education institutions across the Army into a single educational structure. Army University will supplement the current education system in the Army and help streamline the system to ensure education earned there can transfer to civilian schools. The university will also find ways for Soldiers to earn private-sector equivalent credentialing for the work they do in the Army so they don't need to be re-credentialed when they go look for private-sector work. "The intent is to be our own university, to give you the equivalent credit for the things that you do in the Army," Dailey said. "[With Army University], you can capitalize on and maintain use of your tuition assistance and partner with a university outside our gates and use your transcripts from Army University in the future to help build the degree you personally want to work on - which is part of the self-development domain." Today, Soldiers must serve 20 years before earning a retirement. Soldiers, who serve less than 20 years, get no retirement benefits at all. Dailey said there is discussion within the Department of Defense, the Army and the other services about how that might change. "We are doing this because we need reform," he said. "We have an old retirement system ... it only compensates those that stay 20 years. What we are trying to do is make sure that we [provide] compensation and a retirement system that can carry over to all Soldiers, whether they stay three years or 30 years. They will be able to put some in, but yet take some out when they leave." Dailey said the concept is not exclusively an Army effort, but involves all services and the Department of Defense. Changes to the retirement system for Service members would also require input from lawmakers. Dailey also said that he and other senior leaders are working to ensure that if changes ever come to the retirement system, Soldiers already in uniform will be "grandfathered in" under the retirement system that was in place when they joined the military. For Soldiers and their Families, which use TRICARE medical services, Dailey said there is no charge for when Soldiers or dependents miss an appointment with a military doctor. But the sergeant major said that might not always be the case. Missed appointments, he said, are costly. He told Soldiers that missing an appointment is also unfair to other Soldiers, who tried to make an appointment but were unable to, due to a doctor already being scheduled. Dailey also told concerned Soldiers that he believed for the time being that military medical care would remain unchanged, rather than being affected by the Affordable Care Act. He said that some 51 percent of dollars the Army gets from Congress are used for personnel costs, rather than equipment. Personnel costs include medical care for Soldiers. That being the case, he said the military is pressed to find cost savings. "We are taking a look at how we can find efficiencies in our healthcare for both our Soldiers and Families," he said. "I don't think in the foreseeable future that we'll be doing [the Affordable Care Act.] I think in the foreseeable future, it is in the best interest of our Soldiers and our families to maintain healthcare within our military health system." For Soldiers at the town hall concerned that their basic allowance for housing might be cut, Dailey said that is not the case. Rather, he said, it is the intent of the Army that the unbridled growth of the Basic Allowance for Housing, or BAH, entitlement should be slowed. Dailey said that BAH continued to grow through the recession. He said the allowance wasn't ever designed to pay 100 percent of housing costs for Soldiers, though that is what ended up happening. Nevertheless, the Army doesn't plan to "cut" BAH, he said. "What we are saying is we are going to slow the growth," Dailey said, adding that every time BAH is raised, those who rent homes and apartments to Soldiers raise the rents they charge to take advantage. "If we slow the growth of BAH, it shouldn't be hurting Soldiers." 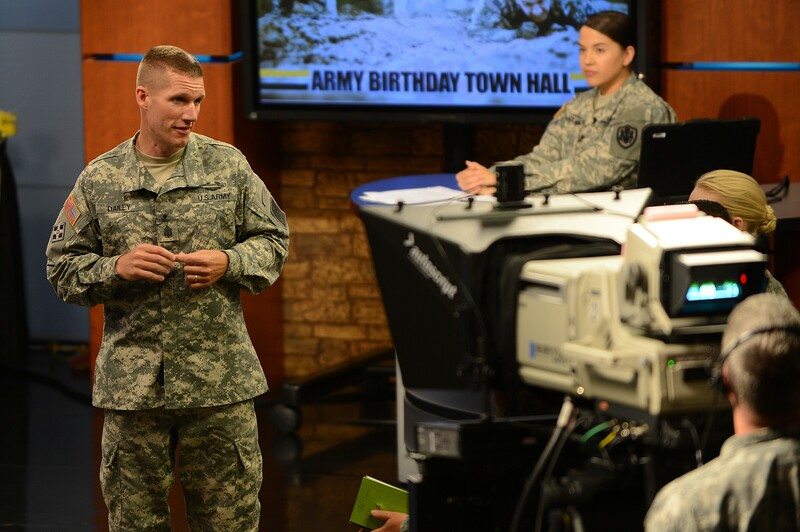 During the town hall, Daily brought forward a Soldier in the audience, who was wearing the new Operational Camouflage Pattern, or OCP, uniform, which the Army will make available in July. He told Soldiers not to go out and buy it. "One thing I want to make important and let everybody know is we don't all need to rush out and get the new uniform. Be patient," he said. "We pay you to replace your uniforms every year with your clothing allowance. Part of that clothing allowance builds up to the amount of uniforms you have in your clothing bags. That's how we determine the wear-out dates." Dailey said that Soldiers have until Oct. 1, 2019, four years and three months from the time the new uniforms appear on shelves, before they will be required to wear the new uniform to work. "I expect Soldiers to use their clothing allowance to do that, over time, so we don't place a significant burden on our young Soldiers and their families," he said. Dailey said the Army doesn't have enough OCP in stock for all Soldiers to get the new uniform immediately. Instead, he said, the Army will distribute the new uniform to commands based on operational need. Those units deploying will get the uniform first. Dailey said that he will continue to wear the Army Combat Uniform until such time he needs to replace it, and only then will he begin purchasing the new OCP uniform. He also told Soldiers that he has asked commanders to respect the required wear date for the new uniform, and to not require Soldiers to spend their own money on the new uniform before the Army requires them to have it. "Allow your clothing allowance dollars to work for you," he said. Dailey also polled Soldiers at the town hall regarding the wear of black socks with the new Army Physical Training uniform. Soldiers all agreed that the uniform would be better with black socks - and Dailey said he's gotten similar input from around the force. He said the message has been conveyed to Army leadership. He also said that he is happy with other Army uniforms, including the Army Service Uniform, and doesn't believe any additional changes need to be made to the current uniform lineup. "I think we need an era of stabilization for our Soldiers and our uniforms," he said. "I think our uniforms right now are well-designed. I like our new dress blue ASU uniform, and I know that our civilian population likes it as well. I get complimented on it quite often." Following the informational portion of the town hall, Dailey and Soldiers did 24 pushups together, one for each decade the Army has been in existence. Then Dailey and a Soldier cut an Army birthday cake, to be shared by those in attendance at the meeting. The U.S. Army turns 240 years old, June 14.